When American scholar Orville Schell first visited China in 1975, Mao Zedong was leading the country through the tumultuous Cultural Revolution, when Chinese were being shamed, beaten and even killed for perceived political mistakes. Four years later, Schell returned to a nation transformed. Mao was dead, and the country was pulling itself together under reformist Deng Xiaoping. 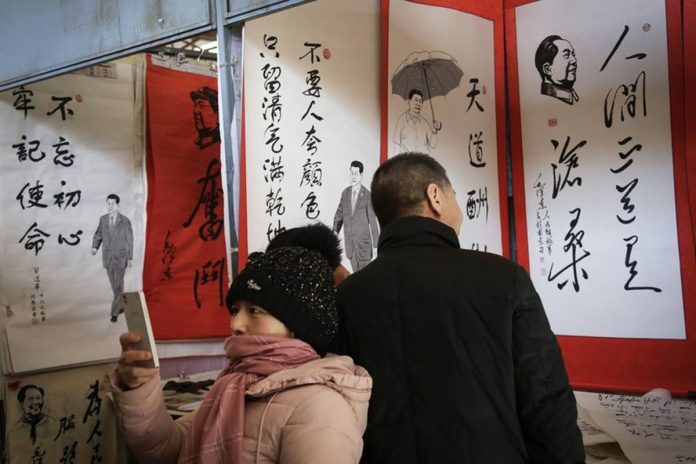 Some Chinese people even plastered posters on a wall in central Beijing, criticizing past excesses and advocating democracy. That opening, followed by Deng’s market-style economic reforms in 1979, ignited Western hopes that — despite the ruling Communist Party’s insistence that it would never share power — China was destined to become a democracy. Those hopes are quickly dissipating with the rise of party leader Xi Jinping, who many once thought would be the next great reformer. Xi is now poised to rule indefinitely after China’s rubber-stamp legislature voted Sunday to eliminate presidential term limits. A small but growing number of Western academics and government analysts who spent decades looking for signs that China was becoming a democracy now say those perceived markers may have been no more than a mirage. Under Deng, the ruling party began to allow small-scale free enterprise and eased social controls. To ensure the party’s survival, communist leaders embarked on a bold experiment in the 1990s to create the Marxist-Leninist world’s first formal system of succession. The Chinese public still had no voice in picking their government, but leaders would share power and step down after fixed terms. Even that has been swept aside by the rise of Xi, who is now poised to rule for as long as he wants as China’s most powerful leader since Mao. The move to scrap presidential limits revives the specter of one-man rule that Deng tried to ward off when he abolished lifetime tenure in 1982 in favor of a more collegial system. Critics accuse the Communist Party of “making a U-turn,” returning China to the tumultuous Mao era and ignoring the lessons of history. But Sidney Rittenberg, 96, one of the few Americans to have personally known Mao, says China will never return to that era of isolation and violent political struggle. He cited the economy’s dependence on openness to the world, Beijing’s rising global status and greater awareness among average Chinese citizens. Today’s Communist Party is different from the way it was during both the Mao and Deng eras, Rittenberg said. Rittenberg, who joined the Chinese Communist Party, was at first impressed by Mao but later experienced firsthand the excesses of absolute power, which he said transformed Mao’s personality. While working as an English teacher and translator in China, Rittenberg first met Mao at a ball in the communist stronghold of Yan’an. At Mao’s request, he spent a day with him just talking about life in America. According to Rittenberg, becoming China’s ruler resulted in a “very clear” change in Mao’s personality. Rittenberg endured the shift, painfully, when he was accused of being part of a foreign spy ring. He spent 16 years in prison, much of it in solitary confinement. Even if today’s China remains far removed from the chaos of Mao’s time, it is likewise distant from the massive student-led protests of 1989, when the country had its closest brush with a shift to greater democracy. The demonstrations, centered on Beijing’s Tiananmen Square, gave voice to pent-up frustrations about corruption and a stifling political system. Deng ordered a violent crackdown that killed hundreds, and possibly thousands, of people. Hopes rose ahead of Beijing’s triumphant 2008 Summer Olympics, cast by the party as a coming-out for a confident, modern China. Instead, the global financial crisis that year prompted the leadership to “rethink the extent to which China should be open to the world,” Jenne said. Perry Link, a Chinese literature scholar who has long been banned from China for his research on the Tiananmen protests, sees Xi’s campaign against critics as a sign of insecurity rather than strength. “Mao was confident in himself. I think Xi on the inside feels not as confident, and that’s why he has to push his change and knock down his rivals, shut up all the lawyers and the journalists,” Link said. Despite that, Link remains among the optimists. “Even if it takes a hundred years and it is the last country in the world to do so, China will turn democratic,” he said. Beijing, however, has long argued that Western-style democracy is not appropriate for China. It cites political and bureaucratic logjams in Washington and elsewhere as evidence of the superiority of its Marxist-Leninist rule.